ideal for those who are experienced with bridges puzzles already, or have worked through the smaller puzzles. 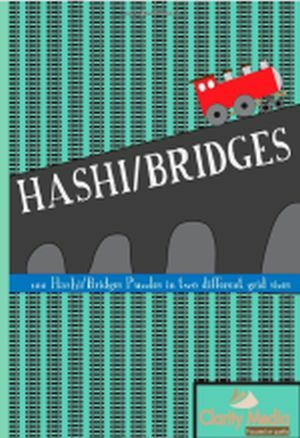 Here are the rules of bridges puzzles (also known as hashi puzzles). 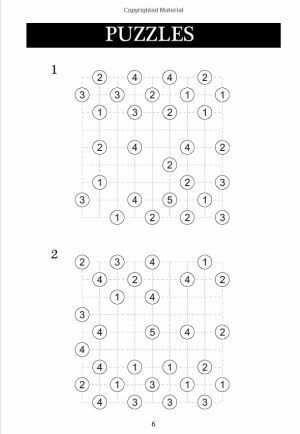 - The grid contains lots of circled cells containing numbers. These are known as islands. - Islands are connected by bridges. The number inside an island tells you how many bridges it has to other islands. - There cannot be more than two bridges between any pair of islands. Bridges must be either vertical or horizontal (not diagonal). Bridges cannot cross each other. - At the end of the puzzle once all bridges are drawn in, it must be possible to move from any island to any other island in the puzzle by walking across bridges from island to island. In other words, there are no isolated groups of islands. If you are uncertain, take a look at a couple of the solutions quickly to see what a valid solution looks like and how the bridges are connected. Firstly, look for instances where a 1 island can go to another 1 island, and put a cross between those two. That's because they can't join together, because if they did they would form an isolated set of just two islands. Similary, with a '2' remember that it can't double-link to another '2'. So if you see a set of bridges whereby a '2' bridge has two neighbours, one of which is another '2' bridge, then you know that it must have AT LEAST one link to the other neighbour that isn't the '2'. This can be very helpful when solving these puzzles. The simplest of all tips is to look at the corners and the edges for high-value islands, as typically at least some bridges for these can be drawn in. Remember the basic rule: there can be no more than two bridges between islands. So an island with a value of '7' with the maximum of four possible neighbours must have at least one link to each, which can be drawn in: that's because the only combination for a '7' is to have both bridges with three islands, and one with another. Of course, an '8' island can be drawn in instantly: it must have double bonds in all directions: for this reason an '8' is rarely seen in bridges or hashi but you do come across it from time to time. Generally when solving puzzles working out where an island must bond, and using the simple rules about non-isolation are all you will need, together with good accounting. Typically this means putting a small cross between islands you know that can't bond to each other, and also it is good practice to put a line through an island when you have placed all its bridges: as miscounting is one of the most common mistakes made when solving bridges and can be very frustrating particularly with the larger puzzles. If you do get stuck, then bear in mind with some bridges puzzles you will need to use more difficult isolation rules: for instance thinking 'if these two islands connect via a bridge then this clump of ten islands will then be isolated from the rest of the grid'. Rest assured that with our puzzles there is a unique logical solution: you will not need to do anything more difficult than the rule just mentioned of looking at possible bridges between islands and working out which will lead to isolation: you won't need any if this and if this type logic.